The Senate Judiciary Committee Friday tabled a bill which would create a fund for a variety of crime prevention programs in the state, from neighborhood watch organizations to drug education programs in schools. There was wide support for the bill’s core concept, but lawmakers did not agree with the funding source, a $10 surcharge to those convicted of crime. Bill Sponsor, Huntley Republican Senator Taylor Brown says crime prevention efforts in communities are very successful. He says these groups are mostly run by volunteers and save Montanans money in law enforcement costs. They often struggle for funding themselves. That funding would create a grant program for crime prevention groups. Butte Addictions Counselor Dan Haffe says bad things happen to good people and the state has not worked hard enough to establish prevention programs in schools. Crime prevention groups themselves stood up in favor, the Montana County Attorneys Association, and the Montana Sheriffs and Peace Officers. Yet, spokesman Jim Smith pointed to what ended up being the problem. “The surcharge is the sticky wicket here,” he said. Montanans convicted of crimes already usually spend about $85 in surcharges. Public Policy Director of the Montana ACLU Niki Zupanic says surcharges are creating a system where those convicted of crimes are being saddled with funding parts of the justice system that everyone has a shared obligation to support. “These costs, fees and assessments add up, and in the aggregate are a real barrier for low-income people to pay their debt, move forward, and put their mistakes behind them,” Zupanic said. 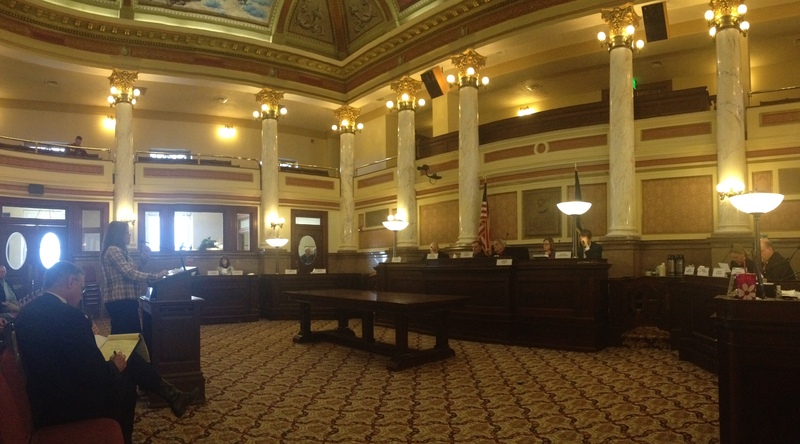 Bill sponsor Taylor Brown argues these fees in Montana are far lower than surrounding states. “We don’t hardly do anything, and maybe that’s fine when you’re a state that has very little crime, but that’s changing,” he said, referring to the oil boom in eastern Montana, and other factors like increasing gang and drug activity. Ultimately, the bipartisan committee voted ten to two to table the bill. Great Falls Democratic Senator Anders Blewett says everyone believes in crime prevention, but sponsors need to think of another way to fund it. Not surcharges. Sponsor Taylor Brown says he did not want this fund to be drawn directly from taxpayers, but he will consider the idea for possibly drawing up a new bill to fund it through the State General Fund. This entry was posted in 2013 Legislature and tagged 2013 Legislature, Anders Blewett, Montana County Attorneys Association, Montana Sheriffs and Peace Officers, Nikki Zupanic, Senate Judiciary Committee, Taylor Brown by Dan Boyce. Bookmark the permalink.